When you set up TLS encryption or certificate-based authentication, you must manage the certificates which are stored in a Network Security Services (NSS). This section describes the most frequent actions about managing the Directory Server's NSS database. Directory Server stores the certificates in an NSS database in the /etc/dirsrv/slapd-instance_name/ directory. Before you can manage the certificates, you must create the database. For security reasons, Red Hat recommends setting a strong password on the database. Directory Server automatically creates the NSS database when you open the Manage Certificates task entry in the Directory Server Console the first time. On the Tasks tab, click Manage Certificates, and set a password to protect the database. The Certificate Signing Request (CSR) is a request to the Certificate Authority (CA) to sign the key of the server. This section describes how to create the CSR including the private key. -o output_file -8 FQDN -s "certificate_subject"
The string specified in the -s parameter must be a valid subject name according to RFC 1485. The CN field is required, and you must set it to the Fully-qualified Domain Name (FQDN) of the server. The other fields are optional. For further details about using certutil, see the certutil(1) man page. After you generated the CSR, submit it to the CA to get a certificate issued. For further details, see your CA's documentation. On the Tasks tab, click Manage Certificates. On the Server Certs tab, click the Request button. 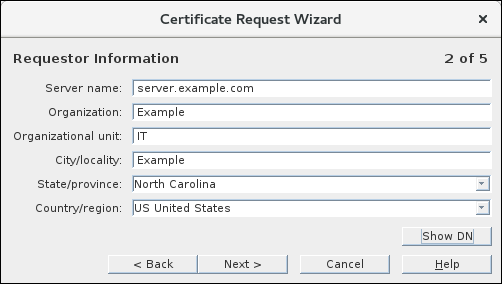 Select if you want to request the certificate manually or from one of the displayed CAs and click Next. Enter the requested information and click Next. Enter the Fully-qualified Domain Name (FQDN) of the server into the Server name field. Select the key size and signing algorithm. Click Next. Enter the password of the Network Security Services (NSS) database and click Done. If you use an Hardware Security Module (HSM) to store the certificates, the device is plugged in, and the module has been installed as described in Section 9.7, “Using Hardware Security Modules”, then the module is available in the Active Encryption Token menu. Copy the CSR to the clipboard or save it into a file. Accepting connections from clients (Client Authentication) T,, The server trusts this CA certificate for issuing client certificates suitable for TLS EXTERNAL binds. Accepting connections to other servers (Server Authentication) C,, The server verifies that certificates, used to establish an encrypted connection to a replication partner, have been issued by a trusted CA. You can set both options for a CA. When you use certutil, pass the -T "CT,," parameter to the utility. 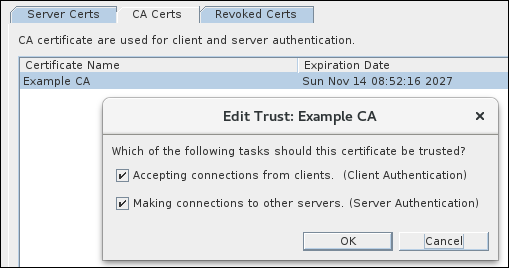 The -t trust_options parameter sets which certificates issued by the CA should be trusted. See Table 9.1, “CA Trust Options”. For further details about the parameters used in the previous command, see the certutil(1) man page. Select the CA Certs tab and click the Install button. 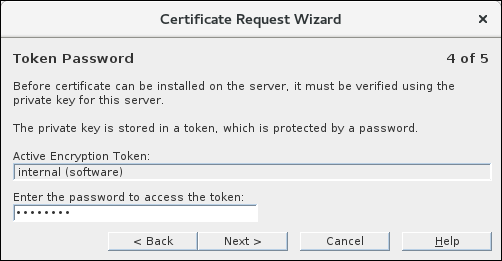 Either select the file that contains the server certificate or paste the certificate into the field. Click Next. Verify the certificate details and click Next. Verify the certificate nickname and click Next. Set which certificates issued by the CA should be trusted. You can select one or both of the options. See Table 9.1, “CA Trust Options”. After the Certificate Authority (CA) issued the requested certificate, you must install it in the Network Security Services (NSS) database. 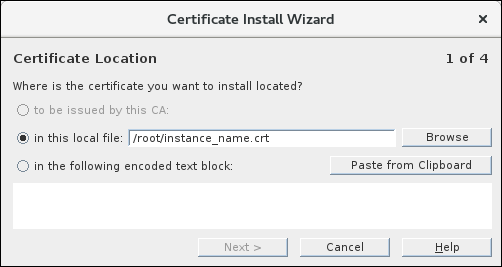 Install the CA certificate. See Section 9.3.3, “Installing a CA Certificate”. For further details about the parameters used in the previous certutil commands, see the certutil(1) man page. Select the file that contains the server certificate or, alternatively, paste the certificate into the field. Click Next. Set a certificate nickname and click Next. 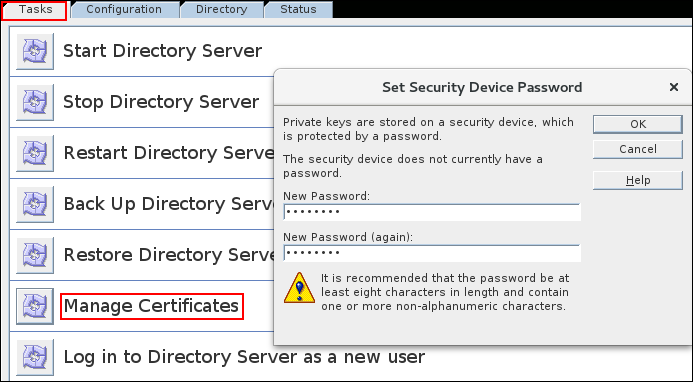 The Directory Server Console does not support installing a certificate that uses the same nickname as an existing one. To work around the problem, install the certificate using the command line. See Section 9.3.4.1, “Installing a Server Certificate Using the Command Line”. Enter the password of the NSS database and click Done. In certain situations, administrators want to use a self-signed certificate for encrypted connections to Directory Server. You can only perform this operation using the command line. If the command fails, initalize the database. For details, see Section 9.3.1, “Creating the NSS Database for a Directory Server Instance”. Red Hat Enterprise Linux automatically replaces the $HOSTNAME variable with the Fully-qualified Domain Name (FQDN) and $RANDOM with a randomly-generated number. For further details about the parameters used in the previous commands, see the certutil(1) man page. # certutil -L -d /etc/dirsrv/slapd-instance_name/ -n "server-cert" | egrep "Issuer|Subject"
The output of this command must display the FQDN of the Directory Server host for both the issuer and subject of the certificate. If a certificate will expire in the near future, you must renew it in time to continue establishing secure connections. After you received the issued certificate from your CA, install it in the database using the same nickname. See Section 9.3.3.1, “Installing a CA Certificate Using the Command Line”. Directory Server will automatically use the newer issued certificate. The process for renewing is similar to generating a Certificate Signing Request (CSR). Follow the procedure in Section 9.3.3.2, “Installing a CA Certificate Using the Console”, but click the Renew instead of the Request button in the Manage Certificates task. If a certificate is no longer needed, for example, because it has been exposed, remove it from the database. Remove the private key. See Section 9.3.8, “Removing a Private Key”. # certutil -d /etc/dirsrv/slapd-instance_name/ -D -n "server-cert"
On the Server Certs tab, select the certificate and click the Delete button. If a private key is no longer needed, for example, because you created a stronger key, remove it from the database. If you remove a private key, certificates based on this key are no longer working. Remove all certificates based on the key you want to delete. See Section 9.3.7, “Removing a Certificate”. certutil: Checking token "NSS Certificate DB" in slot "NSS User Private Key and Certificate Services"
# certutil -d /etc/dirsrv/slapd-instance_name/ -F -n "example-cert"
Removing a private key using the Console is not supported. However, if you request a new certificate using the Console according to Section 9.3.2.2, “Creating a Certificate Signing Request Using the Console”, the Console automatically generates a new private key and uses it. In certain situations you need to update the trust option of a Certificate Authority (CA). This section describes this procedure. To change the trust options of a CA, pass the new options in the -t parameter to the certutil utility. # certutil -d /etc/dirsrv/slapd-instance_name/ -M -t "T,," -n "example-CA"
For further details about the parameters and trust options, see the certutil(1) man page. Select the CA Certs tab. Select the CA to edit, click the Edit Trust button, and set which certificates issued by the CA should be trusted. You can select one or both of the options. See Table 9.1, “CA Trust Options”. In certain situations, administrators want to change the password of the Network Security Services (NSS) database. This section describes this process. If you use a password file to enable Directory Server to automatically open the Network Security Services (NSS) database, you must update the file after you set the new password. See Section 9.4.1.5, “Creating a Password File for Directory Server”. If a Certificate Authority (CA) revokes a certificate, the CA adds the certificate to its Certificate Revocation Lists (CRL). Directory Server can use this list to identify which certificates are no longer trusted by the CA and to deny access. To add a CRL using certutil, pass the -4 URL_to_CRL_file parameter to the utility when you install the CA certificate. 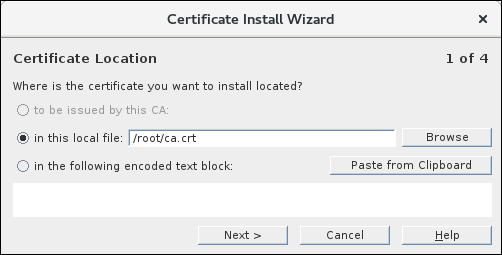 For details about installing a CA certificate, see Section 9.3.3.1, “Installing a CA Certificate Using the Command Line”. Select the Revoked Certs tab and click the Add button. Enter the path to the file, select the list format, and click OK.